The Data Dictionary is used to internationalize your system, by using this feature, you can create a data repository and associate it too one or more tables. 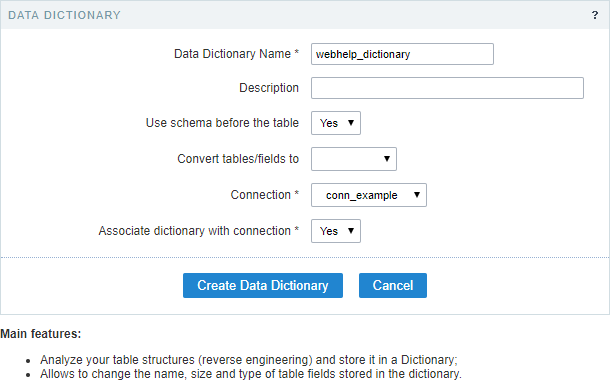 To access this functionality, you need to access it from the main menu Tools > Data Dictionary. Inform the necessary data for the creation of the repository. The files with an asterisk are required. The option Associate dictionary with connection, define a connection to associate with the repository data, allowing that the new applications, created using the tables associated with the repository, have indexes in the language files with the field labels from the tables. Here we need to select the tables that will be added to this repository. After selecting the desired tables click on next. You should choose whether or not to create the indexes (langs) on the field labels of the existing applications of the project. Generate the indexes in the language files of the table fields - On this option the field labels are replaced with he indexes that can be edited in one place when accessing Locales > Application Language. Overwriting the indexes in the language files - On this option, the existing indexes will be overwritten with new data based on the database. Next, we can view a list of tables added to the repository data, where we can view a couple of information about these tables, like the name of the table of the database and the index created for each table, on the label field, and the version of the Data Dictionary of each field. The tables that were not added can be viewed when accessing the Dictionary tables, the process of including these tables to the repository of data is the same. When doing a modification to the structure of the database tables, the same should be updated using the option SYNCHRONIZE DICTIONARY. Next to the name of the tables there’s an icon that indicates the status of the tables. Green - Indicates that the tables and the repository are updated. Red - Indicates that the tables don’t exist in the database, in this case you should delete it from the repository. Yellow - Indicates that the tables are not updated because of some modification in its structure. In these cases, you should click o the link edit referring to the table and click on update, so that the data of the repository could update. Can be found on the right side, in the list of tables. This option allows you to edit the fields from the chosen table, like the data types and the indexes created by the repository for example. Other properties of the fields can be accessed when clicking the plus icon on the right side of the field list. 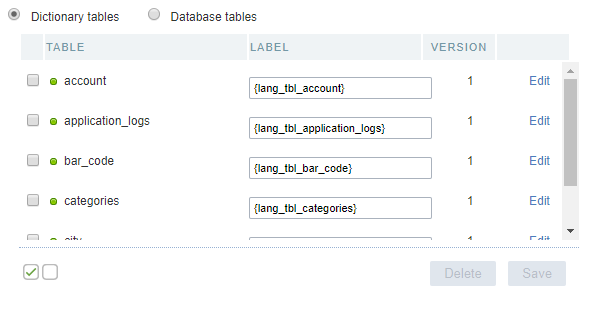 This option is activated when selecting one or more tables, on this option we will update the data dictionary according to the database. When synchronizing the tables, a yellow icon will be displayed on the side of the updated tables, See how to remove it. In case of change the structure of the tables, then you need to resync them again. After doing all the desired configurations on the tables and fields, you need to sync the changes to the existing applications, so that the changes can be applied. First, you need to select the tables that will be synchronized. Next, you can define what will be done and which applications will suffer the modifications. A list of applications, that received the changes, are based on the tables that they used. When clicking on synchronizing, when finishing the process, you will see a summary of the procedure done. Clicking on Back you will return to the Page of definition of modifications. To finish the process, click on close. On the top part, we can view the dictionary properties, informed when created. You have three possible actions, Edit, Reload and Close. Edit - Allows you to change the data of the properties of the dictionary, like the modification of the connection used to associated with repository for example. Reload - Updates all the information of the Data Dictionary, like the status of the table for example. Close - Closes the current data dictionary and you are redirected to the list of dictionary. To edit the created indexes in the repository, access Locales > Application Language. On the side panel is possible to view all the lang from ScriptCase. The langs referring to the data dictionary will be in the folder Project Messages.